Desh Rights is dismayed to learn of the detention of Adilur Rahman, the Secretary General of the Bangladeshi human rights group, Odhikar. Odhikar has been fearless in reporting human rights abuses in the country, without fear or favour. It has been marked by its ability to independently report abuses regardless of whom the perpetrators are. Odhikar recently produced what is regarded to be the most comprehensive study to date on the Dhaka Massacre of 6 May in which at least 60 people were killed after a violent police crackdown against protestors. You can read the Desh Rights briefing on the massacre here. The detention of Adilur Rahman signals a new low for the Bangladeshi government. Not content with perpetrating human rights abuses, the government continues to harass, subvert and detain all those who holds the authorities to account. Desh Rights calls on the international community to immediately call for Adilur Rahman’s release and reappraise urgently any misguided notion that the current Bangladeshi government is a progressive participant in the international community. Adilur Rahman Khan was picked up 10.20 pm on August 10, 2013 and taken to DB custody in Minto Road, Dhaka. He was picked up from in front of his house at Gulshan, upon returning from a relative’s house with his wife and children. The Odhikar office and his home is situated in the same building. The men who picked him up were in plain clothes and said they were from the Detective Branch office. They had no warrant to arrest him. Different news agencies are reporting that he was ‘arrested’ regarding Odhikar’s fact finding of the Hefazate Islam incident on 5 – 6 May, as Odhikar through its fact finding revealed and reported that 61 persons had been killed during the Shapla Chottor crackdown. The media claim that he has been charged under the ICT Act. Odhikar defenders went to the Gulshan Police Station at 2:00 am on 11 August, where the police present denied having any case against him and claimed that they learnt of his arrest from the media. The Government claims that he has been ‘arrested’, however, there was no prior warning or warrant for his arrest. approximately 10 men in plain clothes exited two large vehicles, surrounded him and ushered him away, telling him that he had to come with them. Odhikar defenders went to the DB office at 12:30 am on 11 August, where the sentries denied them entry. After Odhikar released the fact finding report on the human rights violations perpetrated at the Hefazot rally in Motijheel on 5 – 6 May 2013, (see www.odhikar.org)on June 10, 2013 the Information Ministry issued a letter on July 10 , 2013 asking for the the names, family names and addresses of 61 deceased people. Being a human rights organisation and committed to defend the rights of people, Odhikar did not give the list to the government. In its reply letter sent to the Information Ministry on July 17, 2013; and concerned for the security of victims families; Odhikar requested those concerned to form an independent impartial commission headed by a retired judge , where odhikar is willing to submit the names of the 61 victims killed. We are concerned that Adilur Rahman Khan may be taken into remand, where he may face torture or other forms of cruel and degrading treatment. 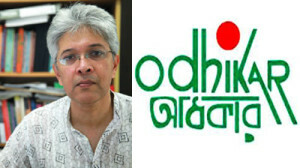 Odhikar appeals to all the concerned people of Bangladesh and all over the world to be united for human rights and the safe release of Adilur Rahman Khan. Adilur Rahman Khan and Odhikar fights for human rights the justice of the people, now its the turn of people to fight for him.